Most have heard or read somewhere along the line that the Armenian Genocide is “hotly debated.” We have often wondered why those who supposedly debate this fact so hotly are oftentimes unidentified – ‘the Turks and a handful of their lackeys’ for sure – who else debates it other than those who have an agenda, hidden or otherwise? We personally have many reasons not to worry too seriously about all this. And like virtually all readers of Groong, we know what Drs. Marashlian and Libaridian have stated so succinctly is the truth. No amount of propaganda can change that sad reality. One particularly annoying aspect is that its seems that the Turkish government grudgingly at best admits that many lives were lost, but on both sides. There was no genocide. Does this not smack of what amounts to a perverted plea bargaining mentality? A nephew recently drew our attention to a ‘Korpehtsi’ Old Armenia photograph that he saw posted on the Western Armenia Facebook site. When we examined the photograph, we recognized it and even suspected where it came from and indeed its origin, but felt that the photograph certainly deserved a more detailed and accurate commentary. In fact, as will become clear below, one of us (ADK) was intimately connected with its preservation. In short, we try here to demonstrate by means of this article how individuals or families who might have access to Old Country photographs can try to elaborate on them both for themselves and posterity. But such an attempt at elaboration should be initiated and carried out starting at a reasonable level of sophistication. It may be a slow process, but the outcome inevitably will be a far more rewarding and valuable one. By so doing, you will have preserved memory and cultural heritage and thereby have shown harkank or respect at an appropriate level. Do what you can, but please try to do it properly and honestly. If it is incomplete, say so, and perhaps someone ‘out there’ can fill in the gaps. There is a wonderful saying among the Armenians of that era that goes something like this: “If you scratch the skin of an Armenian, a relative through marriage will emerge!” [Hayots mahrminuh guh kerress, khunamee geh ellah!] All well and good, but please also recognize the simple fact that one has to set some sort of stage for learning. Merely circulating photos, barely examinable or even of much better quality, is not, we argue, enough. In a word, none of this exposition is meant to be an invective or destructively negative criticism. We mean it to be heuristic. When Djemal Pasha’s book entitled in English translation Memories of a Turkish Statesman - 1913-1919 was published in 1922, he started off his last chapter, entitled “The Armenian Question” with the statement that “We Young Turks unquestionably prefer the Armenians, and particularly the Armenian revolutionaries, to the Greeks and Bulgarians. They are a finer and braver race than the two other nations, open and candid, constant in their friendships, constant in their hatred” (Djemal Pasha, 1922 pg. 241 English language edition). Whether Djemal Pasha meant it or not (for he was a very disingenuous man to say the least) it should perhaps be appreciated that it is in this spirit of boldness and honesty that we take on the challenge of bringing a broader context to this photograph. And, while we deal with this specific photograph, the approach is equally applicable in principle to similar photographs, both those which are old and those which are considerably more recent. It is a matter of preserving one’s heritage and keeping alive whatever remaining legacy there may be. But before we get into the substance of this article, we shall make an effort to locate Korpeh for the reader using a few old maps. Considerably more detailed maps, some more modern, are provided in the Appendix. 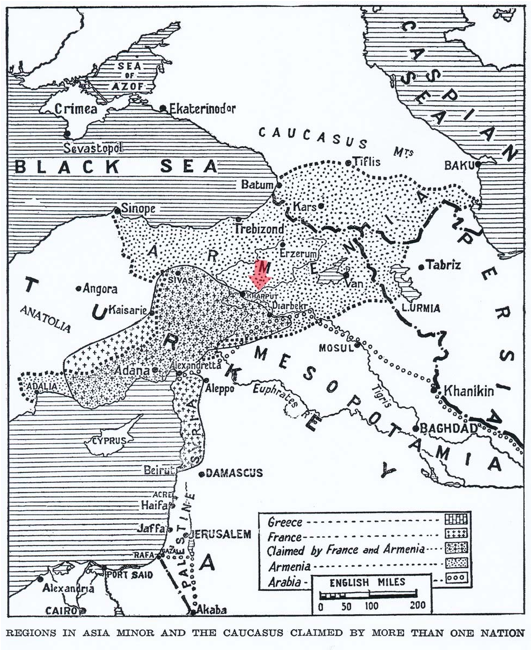 Suffice it for now to say that Korpeh was a purely Armenian village in Kharpert province or Vilayet. There were no Turks or other Muslims living in the village; neither were there any Protestants or Catholics. The above map was first published in Current History (NY) vol. 9 (1919) p. 415. 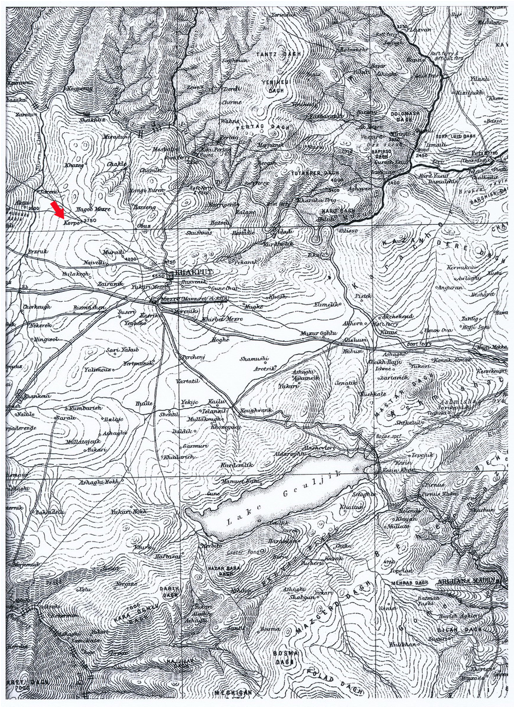 Kharpert (spelled Kharput) has been marked with a red arrow to facilitate location. 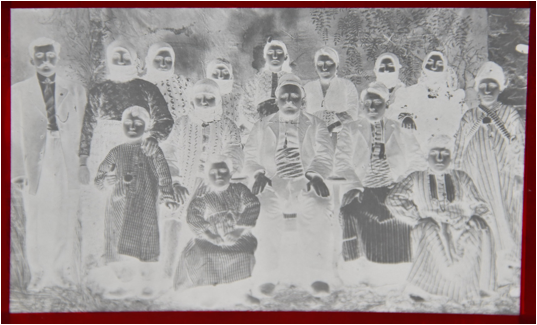 Now that we have a fair idea of the location of Korpeh, relative to the small cities of Kharpert and its lower neighboring town Mezireh, we may return to some of the specifics relating to the family photograph shown below. The villages were the heart of Old Armenia. And it was the villagers, easily described as the “salt of the earth” as a result of their closeness to the land and their traditions and values, who largely survived the Genocide, possibly as some have posited, because they were tough and had become accustomed to hardships under the Turkish yoke. To make a long and rather disturbing story moderately brief, only a few pictured here in the photograph survived the Genocide. The one true Genocide survivor was Altoon Mechigian DerKrikorian. She is standing, back row 2nd from the right with an X marked above her head­­. She survived the Genocide but a young son named Kirkor [note the irk spelling], not present in this photograph, died in a tragic drowning episode early on during the exile ̶ often referred to in Armenian as the Aksor. The two others who did not experience the Genocide were already in America and hence out of the reach of the Genocidists (more below). Altoon’s is a story that we will go into here only very superficially but emphatically state that her experiences, like those of so many other survivors, should be heard by would-be Genocide-deniers or -revisionists before they open their mouths, or use their pens or keyboards. Altoon’s husband Bedros, the slightly older brother of Abraham [Aprahm] DerKrikorian, the father of one of the writers of this commentary (ADK), had emigrated to America, as had Abraham a few years later. 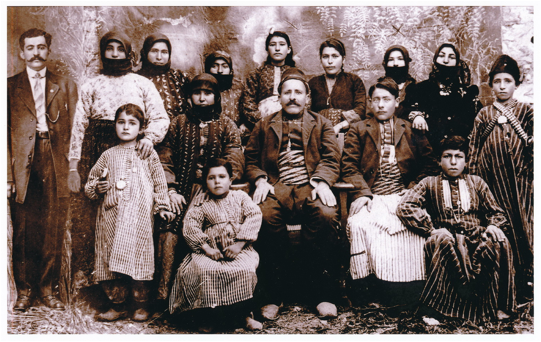 Sarkis Kazarian, the young fellow seated on a stool front row right, also went to America before the Genocide (1912), so he escaped the massacres as well. (Sarkis, a first cousin to Altoon, had been orphaned early on and had been taken into Donabed’s household. Sarkis later served in the U.S. Army and was gassed at Verdun during WW I but survived. He died in 1960 in Worcester, Mass.) As already stated above, family Patriarch Donabed Mechigian is seated in the center of the photograph. He seems portly, and sports a wide, colorful, patterned waist band. We will not comment here on his headgear which is a story unto itself. As was the usual modus operandi during the early stages of the Genocide, the two grown men and one of the youths in this photograph living in the extended household in Korpeh at the time (Donabed, and his son Minas, standing at the left, and younger son Khoren, standing at the right) were taken away and murdered, charte´tsihn — i.e. they massacred them.) The rest of the family members were ‘deported,’ and as was the usual case, most lost their lives in the process. That actually was the purpose of the nominal ‘deportations’ ̶ to get rid of the Armenians. Front row seated, the older woman more or less in front of Khatchkhatoun is Badaskhan Mechigian [this Armenian name means ‘Response’- suggesting that a child was sent as the result of prayer]. She is next to her husband Donabed, i.e. to his right. (She is Donabed’s second wife. His first wife, named Kouvar [Jewel or Precious Stone, sometimes rendered as Pearl], had died some years earlier. The boy seated on a stool and on whose shoulder she has her left hand is Ohannes, a son from her first marriage.) Next, to the left of Donabed, also seated is Sarkis Mechigian, a nephew to Donabed. He is just a year or so older than his cousin Minas, Donabed’s eldest son, and will soon go to America, eventually to settle in Selma in the San Joaquin Valley of California. [He died of botulism poisoning from eating badly ‘canned’ ‘per-per’ (Portulaca olearacea var. sativa, a garden weed which parboiled makes a nice addition to a salad, or even pickled as tourshi for use as an appetizer etc.) at a 1939 New Year’s family gathering. His age was given at time of death as 49. A cousin named Ohan [John] Mechigian (not in the photo) ended up dying from botulism a day later. The young lad with the bandoliers is Khoren, one of Donabed’s sons from his first marriage. Not in the photograph is yet another son Avedis. He was about a dozen years younger than Altoon’s brother Minas. He was never heard from after the Genocide and was presumed to be a victim of it as well. Let us therefore now pick up on Minas Mechigian and try to provide a few additional details. He is the fellow in western dress standing at the far left. He is Altoon’s oldest brother and had gone to the United States hoping to earn enough money to enable him to bring his wife and son Mikhael to America. Unfortunately, that was not to happen. But, fortunately there ends up being some sort of memorial to him in the form of the photograph under consideration, because following a widespread custom, those men upon leaving the Erghirr [the Land] would, whenever possible, take a family group photograph with them, and later have themselves incorporated into the photograph. This was done by having a professionally taken photograph inserted into the group ̶ usually at a margin ̶ and re-photographing the whole. Minas had come back to his village in Turkey from America for a visit, but got caught up in the fury of the Genocide. He was murdered after being ‘arrested’ and ‘taken away’ with his younger brothers as had happened with his father a very short time earlier. It is perhaps worth commenting here that had Minas not taken the photograph to America, and had he not left this copy in America, this family photograph with him in the picture more than likely would not exist. Some years later the photograph was given to Altoon by a friend with whom the photograph had been entrusted, when she finally reached Worcester, Massachusetts, She had survived the Genocide in all its horrors, including time in the Hama encampment (for all practical purposes a concentration camp, or as some foreigners called it a “refugee corral”) in the Vilayet of Suria [Syria], all the while apprehensive for fear that they would be moved out to Der Zor to be killed. The name of the person who kept the family photograph has unfortunately been lost. Perhaps it will surface one day, but it was a fellow ‘keghatsi’ [pronounced as kegh-ah-tsee, or fellow villager] who had emigrated to America earlier, prior to the Genocide. To give yet another dimension to this photograph from Korpeh, it would not exist even today were it not for the actions of ADK, called “Apa” by Altoon. She was known to him as his “NaNa. (NaNa is pronounced with equal emphasis Na-Na. Kooirig is what she was called by ADK’s mother - the affectionate term for sister, more accurately in this case, sister-in-law). As an aside, but we feel an important aside, we venture to interject that there must be very few photographs of families from which one or two family members survived the Genocide, and who actually have photos that they brought directly from the Old Country. We know of only one (that of a brother-in-law’s mother) from another Kharpert village who survived the death marches and massacres. She had secreted a family photograph in her waistband sash or ghodhi [kodi]. Understandably, the medium-sized mounted photograph looks like the ‘survivor’ it truly represents. Fortunately it has now been preserved, scars and all, through high resolution scanning, and those in it have been identified. We suspect that not many photographs from the Old Country would fill the criterion of being an actual Genocide-survivor photo. Getting back to the Korpeh Mechigants Household photograph, on one occasion, when home on break from Cornell University, while visiting his “NaNa” ADK got into a conversation about her experiences in the Old Country. He asked about existing photos from the Ergihrr [the Land] and she brought out the family photograph under discussion. As a doctoral student learning some advanced studio-type photography as part of training for scientific observation, record-keeping, note-taking and documentation, the importance of the photo was immediately recognized. ADK borrowed the photograph and copied it in Ithaca with the help of one of the campus professional photographers, a friend, who had access to a very high quality large format 4 X 5 inch negative camera. Many glossy prints 8.5 X 11 inch were made, sent back to Worcester and distributed by NaNa to family members. That was over 55 years ago. She died in Worcester in May 1974. So as to emphasize that this little aside is not the product of a failing memory or presented for dramatic effect, below is a photograph of the negative, hand-held by ADK and photographed by ELT a few days ago in the summer light of Long Island as background. The red is tape that was used back then for masking unwanted edges of photographs. Most of the red masking has been cropped off in this Photoshop adjusted image. Had an original mounted print of the photograph brought to America not been copied, it would have been truly lost. Inquiries over the years have not turned up the original mounted photograph which was copied by ADK. There surely is a lesson in all this. The composite above is a photograph that was commissioned by Bedros DerKrikorian. It shows him in a western suit. Alongside is his wife, Altoon Mechigian DerKrikorian [much later Simonian]. Her image will be recognized immediately as having been copied from the picture derived from the one from Korpeh. It seems that Bedros [Peter] had access to an ‘original’ photograph in America, had her photographed from that, and inserted her alongside himself in a large-size matte print. It could be that Bedros had a photograph in America and so did Minas but he left it in the care of someone back home when he traveled back to Korpeh. ADK only knows about one that came from Altoon’s brother Minas via a third party. 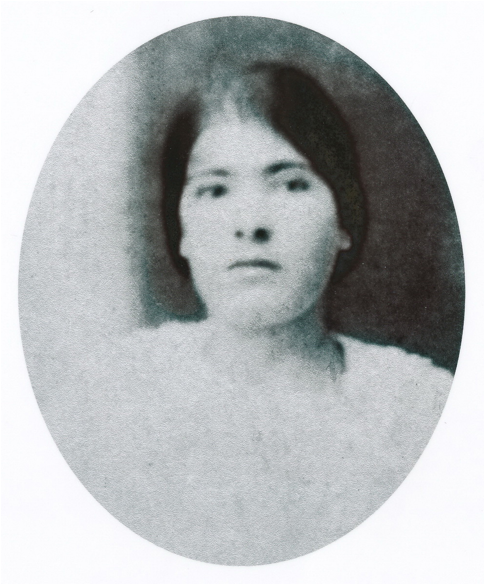 The copy of the photograph below shows an oval crop of Altoon Mechigian DerKrikorian from a full-length photograph taken in Marseille, France just before her emigration to America on the SS. Niagara in February 1921. One can see straightaway that she had shed all appearances of a ‘veiled’ Oriental woman. Some who have seen various photographs or published pictures of some married Armenian village women from the Erghirr may have wondered why any Armenian woman, a Christian, should have had her face covered? It would be pure speculation on our part to say this practice was adopted largely as a result of the extreme intensity of what might be termed acculturation of some Armenian village peasants in some superficial aspects such as dress etc. within the surrounding general and dominant Turkish Muslim environment. We say “Turkish” since married Kurdish women, also Muslims, or Bedouin women did not cover their faces. Turkish women of the villages covered their noses up to the bridge normally as well with the ‘no see-through yashmak’ [final k pronounced with guttural, thus –makh, again fide ADK’s mother], whereas married Armenian women normally covered below the nose, that is mainly covering the mouth. One aspect of using the yashmak may have been purely self-protective. Muslim riff-raff who might have been inclined to try to harass or molest an Armenian woman should she happen to be alone might think twice if he saw that she was wearing a veil. Or, he might have thought that she was one of “them”; that is, Muslim and thus off-limits. A more delicate interpretation might be that the Armenians did not want to antagonize any conservative Muslim element. All this is pure speculation, of course, but none seems unreasonable. The reality of that possibility of apostasy to Islam for self-preservation may well never be known of course. But to round out the picture a bit, the deeply engrained conduct or social behavior concept of ‘Amot’ (shameful) was especially dominant in the Old Country Armenian culture, and one would have been more than likely encouraged in the direction of non-disclosure, or hiding such a shameful [amot] act, even if it had been known, or certainly had it derived from an unverified rumor. But, one point that should be taken into consideration is that two senior Armenian men from Korpeh who made it to America before the Genocide and who were young lads at the time of the Hamidian massacres [“charteroon aden´neruh” - the time of the massacres] and who had fled and taken refuge in the remote hilly area near the village during the worst of it, described to ADK how they hid [baivetsak] but never made mention of any subsequent conversion, or anything close to it. Again, truth be emphasized, few Korpehtsis in America were religious zealots. It was difficult for many of them to reconcile what happened during the massacres and Genocide with a loving God. That does not mean they lost their religion completely but it does mean that they ended up being the ardent realists, cynics or perhaps even pessimists encountered when and after they came America. To close on this sad aspect of village life in Old Armenia ̶ what should really be described as a life of subjugation under a dominant Muslim culture ̶ ADK never believed the reports of conversion when he first read of them. He had too many experiences in very close proximity and close exposure to survivors, and never picked up a hint of it. Unlike apparently some who never spoke of their ‘deportation’ experiences, women survivors from Korpeh never hesitated to tell it like it was. Ordinarily this sort of issue might not even be mentioned, but the fact is that non-trivial questions remain unanswered. Perhaps some enterprising scholars might chance upon this aspect of temporary conversion of some Kharpert villages en masse during the Hamidian period in the future and be able to fill in the gaps. 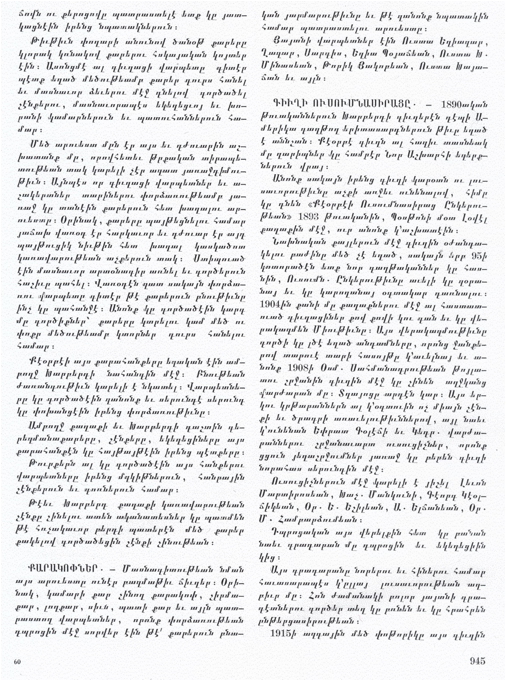 Below we provide the title page in Armenian of one of the two large works dealing with Kharpert on a grandiose scale. This particular work, which we feel is the more complete and thus the more important one, reads:- Kharbert ew anor oskeghen dashte… English title page given as Kharpert and her Golden Plain, [Memorial] book of the history, culture, industry and ethnology industry of the Armenians Therein.” The Armenian title page gives the date as 1957 whereas the English language one gives 1959. The later date reflects the actual date of publication of this heavy volume. Note at the page top the illustration reflecting the ramparts of the Fortress or Pert, and the sheaves of wheat lower down representing the Golden Plain and its prolific grain crops. 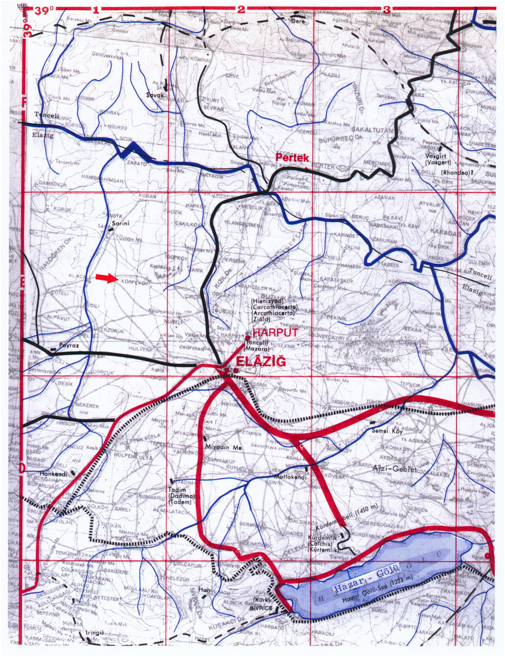 The first map that follows below was taken from this Vahe Haig volume and shows the surrounding villages. The second map shows an enlargement of the same. These two are in Armenian and can be studied by those who can read them. We have taken pains to add a few words in English in red for non-readers. 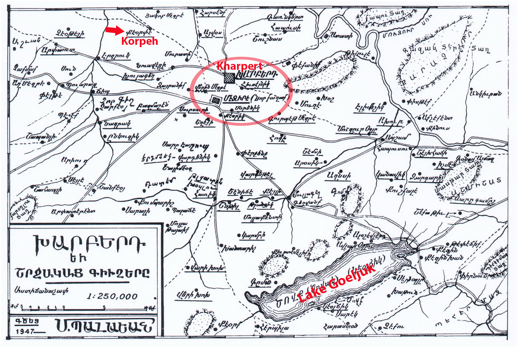 Note Lake Göljuk (today Hazar Gölu) notorious as the location of some of the mass murders, supposedly not of Kharpert people but mostly those from Erzerum etc. The pages of text etc. pertaining to Korpeh village presented after the Kharpert and her Golden Plain maps derive from the Vahe Haig volume as well. 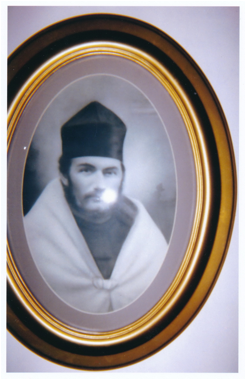 It will be of some interest to note that the oval photo of Khodja-bashi Donabed Mechigian has been cropped from the Old Country family photo and inserted. No mention is made as to its source, or the person(s) who made it available for publishing. This would seem to strengthen the view that more than one photograph exists, that is in addition to the one ADK and George Lavris copied. 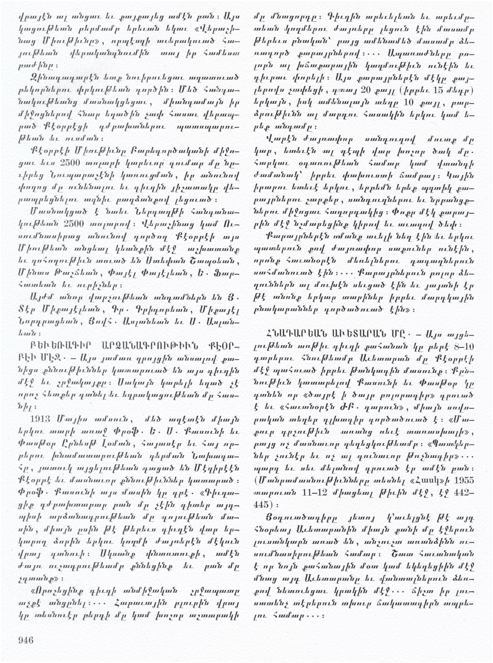 No effort has been made here to translate the original Armenian. (Ohr mi as the oldsters used to say “Perhaps, one day!”) It is of some interest that the ‘chapter’ heading transliterates as Keorpeh Kiughuh. The designation for ‘the village’ pronounced kiughuh is in so-called makur hayeren [proper (clean or pristine) Armenian]. The Kharpert dialect form would inevitably state kegh´uh. And therefrom, the term for a villager becomes kegh´atsi- not kiughatsi. 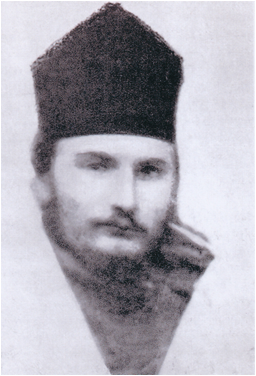 The caption beneath Donabed Mechigian’s photo and name states that he was the nahabed of Keorpeh. He was always referred to as the Khoja-bashi, including by his daughter and other kegh´atsis (ADK personal knowledge) and this fact should not be lost sight of. Nahabed may well sound better in proper Armenian but facts are facts. And nuances do matter in establishing accurate identities of villages and the inhabitants thereof. We shall save our comments on the other images selected for use in the Korpeh entry of Vahe Haig’s book for another occasion. The caption under the photograph on page 944 (lower right) is of particular interest however since it not only gives the pronunciation/spelling as Keorpeh but adds “gam Keropeh” (“or Keropeh”). Good examples of the fluidity mentioned. We must now draw the reader’s attention to a seminal work on Keropeh written by Harootune Shabouian (1894-1973) of Korpeh and Lowell, Massachusetts. It was not formally published but was hand written and eventually printed by off-set. The 192 page long work was finished in the late 1950s but had been started a lot earlier of course. Mr. Shabouian was a barber and this work was clearly done as a labor of love. An especially useful part of this very interesting softbound, illustrated volume is that it includes what we refer to as a numerical “Household Listing” with arbitrary House Number and Family name, first name of the head of the household, the first names of those in the household, estimated ages and annotations such as emigration to America, or wherever, whether a person survived the Genocide or, whether as a few did ‘turned Turk.’ Such an accounting of a village population is very unusual, perhaps even unique. 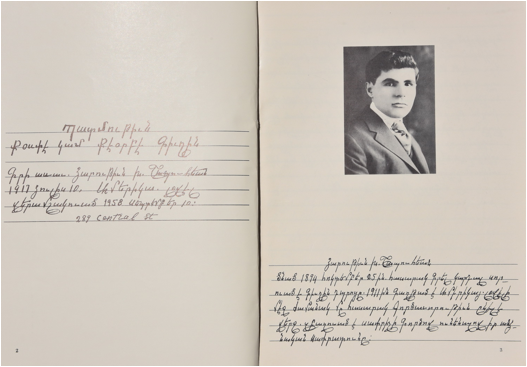 A couple of pages from the book, one of which includes a photograph of the author as a young man, are provided below. One can see from the drawing that Keropeh was a mountainside village. [Refer to Endnote 8 for precise details.] The village church seen in the lower center bore the name Sourp Asdvadzadzin [Holy Mother of God]. According to Harootune Shabouian, the village schools, one for boys and one for girls, were next to the Church. In 1908 thanks to the financial assistance provided by the Keorpeh Educational Union, founded by emigrants from the village living in the USA, a new boy’s school was constructed, and the old one was assigned to the educational needs of girls. We do not want to allocate a lot of additional space to saying much more about the village here but attention might well be drawn with profit to a few other relevant points. These will serve to underscore a few of the generalities already stated with reference to the Khoja-bashi Mechigian’s family photograph. Below we give a copy of a photograph of a family from Korpeh. On the right hand side is Garabed Sarkisian who emigrated to Lowell, Massachusetts as a married man. (He arrived at Ellis Island on November 11, 1912, age 20.) Again, Garabed has been added ex post facto to the photograph but it is a poor job. He looks too small and disproportionate to fit in well with the others. Next to him is his wife Serpouhi. She, like Altoon Mechigian DerKrikorian is in namahrem with a yashmak or face covering. She wears a necklace with many coins strung on it. They seem to be silver Mejidiehs rather than golds or altuns since gold pieces were usually much smaller. Below we see portions of a work that remains today in the hands of the Sarkisian family. The original is a badly damaged and poorly aged color painting of Garabed and his wife Serpouhie (and Garabed’s sister as well although we have not included her here) that was clearly based on the faces in the full family photograph above. It was painted by somebody or other in either Worcester or Lowell. We scanned it for preservation purposes and ovals were cropped out. Unfortunately, Diggin Serpouhie (Mrs. Serpouhie) is half-missing, ‘chopped off’ as it were due to disintegration of the paper, but it was repaired a bit by us using Photoshop. All this emphasizes that Garabed missed his family very much and also had an aesthetic, artistic sense. Serpouhie entered the United States at Ellis Island in the autumn of 1920. Garabed had not seen his wife for 8 years! He died in 1962; she in 1973. Finally, a word might be in order about some of those who were among the very first victims of the Genocide at Korpeh. The village priest, Der Boghos (Father Paul) or Boghos Kahana [married priest] Bedrossian, is shown below left. This image was copied from a reproduced photograph in Vahe Haig’s book pg. 611. 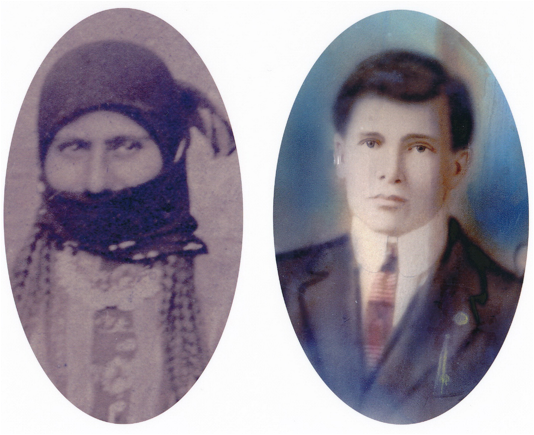 On the right is a photograph now in the hands of a relative descended from a son of Der Boghos named Sahag. 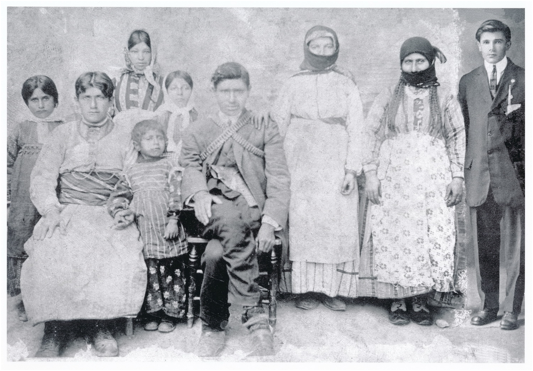 Sahag emigrated to America before the Genocide. The framed photograph derives from an ‘original’ or at least better print of the same image that we find in Vahe Haig’s book. Although there is a “hot spot” on the photograph on the right, it will be appreciated that it is considerably clearer. Harootune Shabouian gives his age as around 43 when he was taken away and murdered. Thus, Khoja-bashi Donabed and Der Boghos, that is the Village Headman and Village Priest, were the first to be done away with (fide family). On that sad note we shall end this tale of Genocide and witness through family photographs. 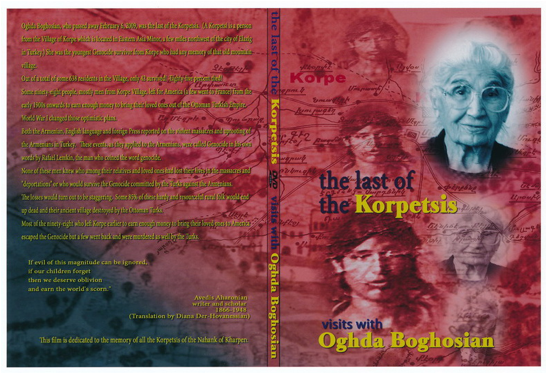 The last of the Korpehtsis, that is the last person born in Korpeh, Kharpert was Oghda Tuschonts Boghosian. Her exact age was not absolutely certain but she was over 100 when she died in 2009 in Fowler, California. Her passing indeed signaled to all Korpetsi descendants that one had come to the end of an era. The following copy derives from a British Ministry of Defence map prepared around 1915. Korpeh (here spelled Korpe) is shown with a red arrow. Note that the notorious Lake Goeljuk or Göljuk, today Hazar Gölu is spelled Geuljik. The altitude lines give an idea as to how hilly the region was. Many missionaries and other Americans who had been to Colorado in the old days said it generally reminded them of Colorado. 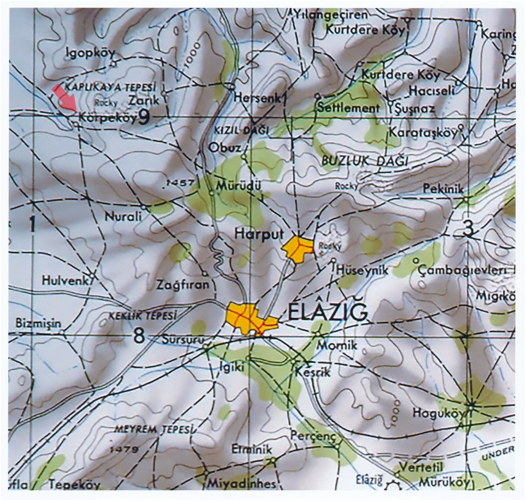 Below is a road map published in 1998 that gives the modern name of Elȃzig [area shown in yellow], instead of the former place name of Mezireh. (Elazig is strictly speaking, not on the exact as old Mezireh. Harput [also in yellow] is a considerably smaller place these days than the early upper Kharpert City that the Armenians knew. Körpeköy (Korpeh village) is indicated by a red arrow. The next two maps are from the Fr. Fritz’ Codex Kultur-Atlas Türkiye, Türkei, Turkey Teil 9, 38/35-44 (1965-1966, Codex-Verlag, Gundholzen - 1:300,000). Körpeköy (Korpeh village) is indicated by a red arrow. Lake Göljuk re-named Hazar Gölu will be readily located. We have quite a few people to thank for their help and encouragement over the years. They are so many that we will not mention them by name. Sadly, many have now passed on. Others who are still alive will know who they are. None of this would have been possible without them. Our sincere and heartfelt thanks. Wright Morris (1981) The camera Eye. Critical Inquiry vol. 8, no. 1 (Autumn) pp. 1-14 p. 4. We will perhaps be forgiven for not being adherents or admirers of the prevalent culture referred to in abbreviated form as “PC” – “political correctness” or “politically correct.” Frankly, we tire of self-serving myths and selective renderings of factoids by deniers of the Armenian Genocide. 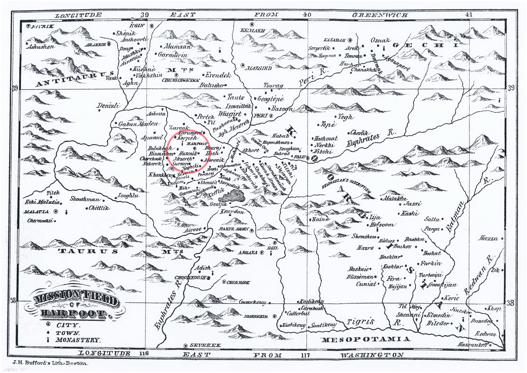 The older Korpehtsis, the natives of Korpeh, knew, of course, that the original name of their hilly village was Keropeh in Armenian, alluding to the cherubim since it was a ‘mountainous’ village. (Incidentally the word korpe in Turkish is said to mean “the littlest child.” (On that basis alone one would reject any Turkish origin for Keropeh village’s name. 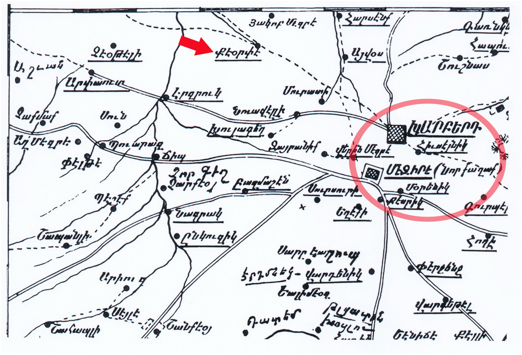 It is curious though that efforts to erase Armenian village names and to replace them with Turkish ones was overlooked by those responsible in this effort. Our conjecture is that this ‘oversight’ was not in fact an oversight but more likely an unawareness of the full Armenian heritage of the village. It was in short not changed out of ignorance.) 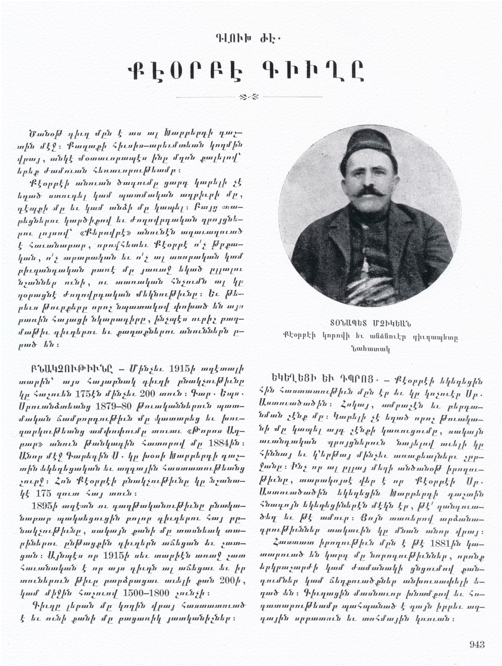 In any case, survivors who knew that Keropeh was the Armenian name, would inevitably refer to themselves as Korpehtsis—articulated as Korr-peh-tsees (equal emphasis on all syllables; therefore our preference for the transliteration as Korpeh, not Korpe. Village names could be a bit fluid according to the specific time-frame under discussion. As another example of this sort, some of the villagers from Ashodavan referred to themselves as Ashodavantsis but most referred to their village as Ahsh-vunn, thus becoming Ashvuntsis. The original village, spelled Aşvan more recently in Turkish. as they once knew it has now long since become inundated as part of the dam projects. Ashvuntsis and Korpehtis were especially close friends in Worcester, Massachusetts. Back in February 2010 we were stimulated to write an essay on a faked photograph that was causing some consternation and clamor. Initially we thought it was the usual Turkish genocide-denial tempest in a teapot. It was indeed, but since we knew the photograph well, we felt it demanded an explanation. We were told by a Greek friend in England, born in Turkey, that the discussion essentially came to an end after our Groong posting was circulated (see http://groong.usc.edu/orig/ak-20100222.html). It was entitled THE SAGA SURROUNDING A FORGED PHOTOGRAPH FROM THE ERA OF THE ARMENIAN GENOCIDE DEMONIZING AND VILIFYING A "CRUEL TURKISH OFFICIAL": A PART OF "THE REST OF THE STORY." 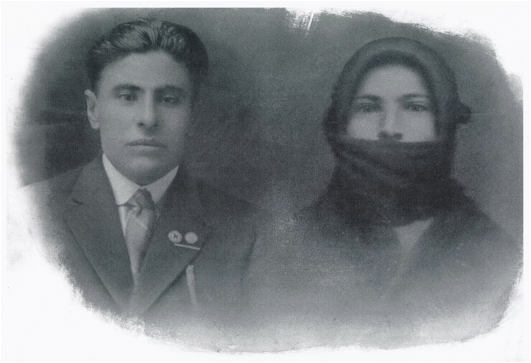 We showed that the forged photograph was published at least as early as 1919 in a book in Armenian printed in Cairo. A publication trail back to its source was presented for the forged (‘faked’) reconstructed image. We concluded that the `silver lining' in all this was that it would hopefully stimulate work on the study of attestation and attribution of photographs relevant to the Armenian Genocide and atrocities in the broadest context. Photographs and their captions ought to `say exactly what they mean' and `mean what they say.' We wrote then, and repeat now that the Armenian Genocide needs no validation by photographs but we owe it to those who lost their lives and those who survived to do as good a job as possible. The Armenians, especially in the villages followed the rule that noone should marry a person who was not at least 7 times removed as to any potential relationship [so-called askagan of yohtuh bodh.] It is an interesting point that peasants seemed to have understood a fair amount about what we now call genetic counseling? They seemed to be able to figure out details of relatedness every bit as effectively as the computer program “Family Tree Maker”! After the genocide, when there were far fewer options open to survivors, some of the traditional rules were broken on rare occasion but a priest that we knew admitted that if there was any sin in performing marriages of individuals who might have been a bit closer in relatedness than might otherwise have been sanctioned, then ‘Let the sin be on me [merkh´uh unzi]!’ Back in 1980 Dr. Sarkis Karayan published an article in The Armenian Review vol. 33, pgs. 89-96 entitled “Histories of the Armenian Communities in Turkey.” Somewhere along the line this listing was placed on the Internet. We draw attention to this valuable paper again for it is in such sources that this level of information about traditions and practices will emerge now that the survivors who were sources of information have now passed on. In a review of Djemal’s book Memories by the distinguished political scientist and historian Baron Sergei Alexandrovich Korff (1876-1924) we read: “The last chapter of the book deals with the Armenian question and contains an extremely weak apology for the misdeeds of the Turkish government. Djemal cannot deny the terrible massacres, but his arguments of justification and explanation seem utterly inadequate; they only help to prove how absolutely impossible the Turkish rule over Christian and non-Mussulman minorities always was and always will be, whatever party should come into power or whatever its intentions may be” (see American Historical Review vol. 28, no. 4 July 1923, pp. 748-750). For another cool contemporary review see Bernadotte E. Schmitt in Political Science Quarterly vol. 38, no. 3, Sept. 1923 pp. 500-503. She says that “He insists that he “had nothing to do with the deportations and Armenian massacres” and he endeavored to assist the refugees.” It is, understandably, beyond the intent of this essay to deal with Djemals claims. Spellings of Armenian place names as reflected in local pronunciations vary. Keropeh was the usual Armenian name. Keorpeh was also used by Armenians. (We won’t go into how sounds and letters as consonant and vowel shifts came to be switched according to local usage and dialects — just think of those who used different pronunciations for bugh´lur versus bul´ghur for parboiled cracked wheat). The Turks referred to the village as Körpe and it is still referred to as Körpeköy, or Körpe village. The “Korpehtsis” were, first of all, “Kharpertsis.” That is, they designated themselves as people who came from the Province of Kharpert. Kharpert Province was located in eastern Asia Minor. (We prefer not to use the designation ‘Anatolia’ as some have elected to do because use of the term Anatolia, deriving from Greek meaning ‘the east,’ was originally restricted geographically to the westernmost part of the Western Asiatic peninsula.) When spoken of in the context of the borders of the old Ottoman Empire, Kharpert Province or Mamuret ul Aziz Vilayet as it was referred to in English etc. [from the old style Eyalet, meaning Province or State in Turkish] were changed several times for various purposes such as facilitating better administration but also including such reasons like what we now call ‘gerrymandering’– to the advantage of the Muslim population and to the disadvantage of the Armenian Christian population. In late Ottoman times the Vilayet was known by the Muslim name of “Mamuret ul Aziz” and in fact, Elazig (pronounced EHL-lah-zuh), the name used nowadays for the ‘new’ ‘state’ capital is nothing more than an abbreviated form derived from the old name of Mamuret- ul-Aziz — meaning in Turkish — Mehmet’s beloved — Mehmet was one of the Ottoman Sultans; aziz means the ‘dear or beloved’. The town/small city of Mamuret ul Aziz was known as Mezireh (or Mezre etc.) to the Armenians and more often than not, referred to simply by close-by villagers as ‘Kaghakuh’—“the” City. Villagers hardly had cause to spend much time in Kharpert city, whereas shopping and business matters were routinely done in the lower town of Mezireh. After the birth of the so-called Turkish Republic in 1923 the borders of the old Vilayet/Province were changed again and Armenian town names were changed to make them ‘sound’ “more Turkish.” As recently as twenty-five years ago one could encounter spellings of Elazig as Elaziz, Elazid, Elazýýð, Alaziz, Mamuret el-Aziz, Mamuret-ul-Aziz and Mamurelulaziz but we venture to say that those are sure to have died out. 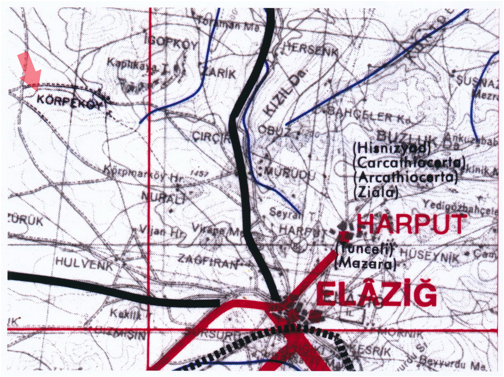 Again, Elazig/Harput now represents but a small part of the old Kharpert region. Indeed, the name Kharpert is no more. We should also emphasize here that Kharpert was used to designate not only the Province, but one of the two key ‘cities’ of the Province. Kharpert Khaghahk—meaning Kharpert City in Armenian; the other being Mezireh, in Armenian. Kharpert or Harput was situated on the top of a small mountain and was in name only the ‘official’ seat of the Ottoman Turkish Provincial Government. Mezireh was more the business center but it was also the seat of the 11th Army Corps of the Ottoman Army. The Vali, or Governor-General of the Vilayet also lived in the official residence or Konak in Mezireh/Mamuret-ul-Aziz. An English friend working in Germany at the University of Cologne years ago and specialist in Turkish anthropology communicated to me that today’s Körpeköy, i.e. 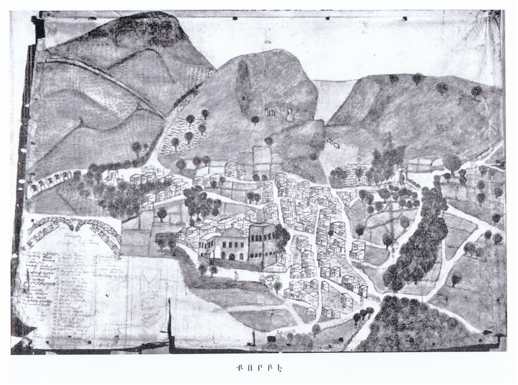 today’s Körpeh village, is in the extreme SW corner of what is now the Harput district, placed, as so many Anatolian villages are, on the skirts of hills which rise to its east. It is NW of Elazig on the road between Şahinkaya (that is S with cedilla) and Üctepe (U with umlaut): from Elazig one takes the Keban road, and it is the first road to the right. The location is 38.46 degrees N. and 39.08, degrees E. (We have also seen the geo-positioning listed as 38°45´10´´and 39°7´55´´ DMS, degrees, minutes, seconds. A very large hydrological project (GAP) has been realized in the region, and the largest dam is in fact the Keban Dam. This must have altered the whole subsistence of the area. Körpeh is well away from the water! In short, the Village still exists. How it was meant to be pronounced in America and the west was stated in print more than once (e.g. Herman Norton Barnum in The Missionary Herald vol. 72 January (1876) pg. 5. The choice to transliterate the place name by English speakers into Harpoot ̶ Har- poot, with the H advisedly guttural rather than the equivalent Kh seems to have been quite deliberate in view of the need for accurate pronunciation. But the fact was that many westerners subsequently found it a challenge to make guttural sounds and Harpoot often simply ended up being pronounced with an ‘H’ – just like it was spelled, as in the word house which started with an aitch! The early reminders in print that it was to be pronounced with the guttural seems to have been lost fairly early on. Harpoot is nearly always the spelling in romanized transliteration of the Armenian Kharpert in the old literature. Today, Harput is generally retained in the Turkish spelling (and pronunciation). What took place with the transliterated Turkish place name starting with H (originally pronounced as with guttural Kh although spelled by westerners with an H) also happened across the board and in many other cases. The much-touted reform edict of 1856 Hatt-i-Humayun was actually initially pronounced (and spelled by westerners) Khatt. Germans usually spelled it Charput, the French usually as Kharpouthe. The Danish missionaries usually used Harpoot (and Mezre, rather than our preference for Mezireh). 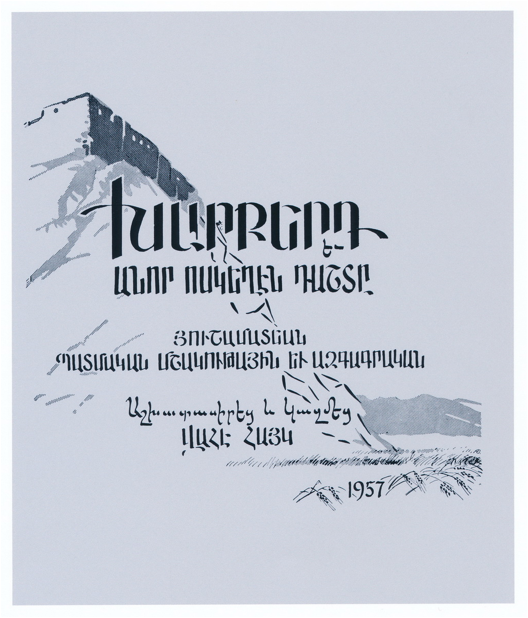 For those who can read western Armenian, the reference of choice is Vahe Haig’s [original Armenian name Haig Dindjian] Kharberd ew anor oskeghen dashte: hushamatean azgayin, patmakan, mshakut̀ayin ew azgagrakan (New York: Kharpert Armenian Patriotic Union) 1959. This big (1500 pgs. long) heavy, illustrated tome was "Prepared and published under the auspices of the Kharpert Armenian Patriotic Union." (ADK recalls it had a prepublication subscription price of around $45 a fairly hefty price at that time.) Note the inconsistency of cataloger’s Kharberd and the Patriotic Union’s Kharpert. ADK never heard Kharberd used by Kharpertsis. It seems that spelling should be relegated to academic obscurity. All this reflects the weakness of rules of transliteration that mercifully few follow. Some will know that an X now supposedly replaces kh. Another work that never achieved the popularity of Vahe Haig’s book is that put out in 1955 by Manoog Djizmedjian entitled Kharpert yev ir Zavagnere [Kharpert and its Children], Fresno, 1955. It was 749 pages long and illustrated but does not as does the Vahe Haig volume cover the 65 or so individual villages in the Kharpert Plain. We cannot resist drawing attention to the spelling of the author’s surname in WorldCat, an authoritative device used by professional librarians for locating works in participating libraries throughout the world. There the spelling is Chizmechean, Manuk G. Just who might think of tracking down a volume under that spelling? So much for transliterations and Romanizing. For English readers one should refer to Richard G. Hovannisian, ed. Armenian Tsopk/Kharpert, (Costa Mesa, California: Mazda Publishers, 2002) for many details on Kharpert. For a general but good account of the events at Kharpert/Harpoot during and immediately after the Hamidian massacres and the relief work with orphans of that period etc. one can refer to William Ellsworth Strong's The Story of the American Board; an Account of the First Hundred Years of the American Board of Commissioners for Foreign Missions (Boston: New York, The Pilgrim Press; Boston, American Board of Commissioners for Foreign Missions, 1910) − for a digitized version go to https://archive.org/details/storyofamericanb1910stro. A more modern perspective on the range of activities undertaken by the American missionaries is provided by Barbara J. Merguerian in her "Missions in Eden: Shaping an Educational and Social Program for the Armenians of Eastern Turkey" in New Faith in Ancient Lands. Western Missions in the Middle East in the Nineteenth and Early Twentieth Centuries, ed. Heleen Murre-van den Berg (Leiden and Boston: Brill, 2007) pgs. 241-261. Reference should also be made to Jonathan Conant Page's, Ringing the Gotchnag : Two American Missionary Families in Turkey, 1855-1922 (Boston: New England Historic Genealogical Society, 2009) for a very readable, yet scholarly account of the long-serving missionary families of Wheeler and Allen and their work at Harpoot. Finally, although it may seem that we have undertaken to write a dissertation on Kharpert, we would be remiss to not make it clear that Kharpert, as the Armenians knew it is no more. The province referred to as Kharpert is no more. The lower city of Mezireh, the provincial capital is really no more. Years ago we asked a linguist friend to dissect the name. Here goes. “Ma´muret (with an ´ain or glottal stop: Arabic) means a prosperous and cultivated place, or 2. (Simply) An inhabited place or town. ´Aziz (glottal stop again: Arabic) means dear or beloved, or 2. Even sacred, holy (´aziz also meaning saint), or 3. Rare, highly esteemed. Although 3 is a learned usage, it seems most likely to be the one appropriate here, with no. 3 as a secondary and complimentary connotation. In short, Ma´muretul´aziz (with two dots over the u) was the former term (now obsolete) for Elazig.” The provincial boundaries are quite different now. It must also be remembered that the Vilayets or provinces came into being in 1864. Prior to that there were Pashaliks, for example the Pashalik of Harput! It may be of some interest for those interested in Armenian names, to note that family referred to itself at the time as ‘Mechigants.’ Mechigian per se crept in somewhat later. Complications engendered by seeming inconsistency in surnames to non-Armenians especially among the villagers caused considerable problems for the foreign Consuls who had to try to navigate in the areas populated by Armenians for three millennia. The patronymic -ian ending [yan etc.] widely associated nowadays with Armenian surnames became regularized at a substantially later date - in America frequently only upon immigration. Her Armenian Christian name was Voskitel [Golden Thread] but Altoon stuck. Altoon was the word for Gold in Turkish. Thus the name would be akin to Goldie as in Goldie Hawn the actress, or Golda Meir, the one-time Premier of Israel. We cannot here go into the matter of Armenian men preferring to leave the Ottoman Empire rather than stay and suffer the consequences. This was especially so when it seemed clear that universal conscription would be instituted according to the second Constitutional regime. From what we know, it depended – some did, but others simply ‘read the writing on the wall’ and decided to try to get to America, even under the most difficult conditions. This even included cases of bribing under the guise of feigning pilgrimage to Jerusalem for religious celebrations and as pilgrims, only to again, by dint of bribery, further make one’s way from a port like Beirut on a ship going to Alexandria, and then further outbound. These men even had the traditional small tattoo memento [a Cross] near the base of their thumb, between the forefinger. This indicated that they had been hadjis, a term used for both Muslims and Armenians (ADK, personal knowledge of a relative through marriage.) Some Armenian men did make it out of the Turkish Empire before the Genocide, earned enough to try to get relatives out, but the outbreak of the War precluded that. One in particular (ADK’s mother paternal [and maternal] Uncle) lost their families in the Genocide. One took up drink and eventually drowned as a result of too much drink. The other became a Gamavor or Volunteer in the French Légion d’Orient, but never remarried. One of ADK’s father’s cousins was taken into the Ottoman army. His is yet another story. These personal details are mentioned merely to show how various stories of experience and survival can be elaborated upon ad infinitum. The first to die of this botulism poisoning was Sarkis Mechigian on January 3, 1939 (see Fresno Bee January 4, 1939 pg.1. His age was given as 48). His younger cousin Ohannes Mechigian, age 40, died of botulism poisoning on January 4, Fresno Bee, again pg. 1.) Ohannes’ wife Margaret was also stricken but she survived after she was administered serum rushed from UC Berkeley that did not get there in time for the two cousins (Fresno Bee January 9). The story of pickled or bottled per-per (a green from Portulaca olerace used in salads etc.) as the source of the botulism (circulated back East after their deaths) has not been verified by us. Another story going around was that the home-made sausage (basturma?) may have been the origin of the bacterium. Margaret Mechigian, 1939 survivor of botulism died in Selma at the age of 57 on July 1, 1962 (see Fresno Bee July 3, 1962.) She left two daughters and a son, and a granddaughter. We thank Ms. Melissa Scroggins of the Heritage Center, Fresno County Public Library for her kind help. George A. Lavris, of Greek ancestry, helped ADK save this important photo. Ruth Thomasian, who founded Armenian Project Save back in 1975, has been a pioneer in trying to save the photographic heritage of the Armenians in America. Sadly, all too often the identity of all the individuals in photographs is missing or incomplete. Another lesson, label photographs when and while you can and to the fullest extent you are able! One hears and knows of “support groups” for this that and everything else these days. Those survivors from Korpeh, some 37 women, an odd grown male or two who escaped from military service and made it back to America through a ‘back door’ like Asiatic Russia, and a couple of male children separated from parents and fellow villagers, out of the entire village of some 127 households and a population of some 700 or so sought support and consolation by talking about it with those had experienced similar or nearly exactly the same thing. One young boy, a little cousin to ADK’s mother, was encountered by her in an Aleppo orphanage, came to America and ended up in a state mental hospital. Another young lad survivor, ended up in Beirut unbeknownst to most Korpetsis. One of his sons showed up quite a few years later in America announcing his Korpehtsi connections! One can do the arithmetic and see that most of the villagers – more than 80% ̶ lost their lives in the Genocide. Actually catalogued in World Cat as Kharberd ew anor oskeghen dashte : hushamatean azgayin, patmakan, mshakut‘‘ayin ew azgagrakan / Ashkhatasirets‘‘ ew kazmets‘‘ by Vahe Hayk. Niu York: Kharpert Armenian Patriotic Union, 1959. Vahe Hayk. 1500 p. : ill. (some col.) ; 28 cm. "Prepared and published under the auspices of the Kharpert Armenian Patriotic Union." Some years ago we reduced the information to searchable format spread sheets that used columns to segregate specific information. Garabed means the Forerunner, as in John the Baptist. Very often, albeit incorrectly, as was the case with Garabed Sarkisian, Garabed was made into Charles in English. He died in November 1962. Serpouhie, means ‘holy’ woman [in appearance; Angel[ica]” would be a very close equivalent in English. As it turns out, she was Sophie on her Americanized death papers. She died in April 1982. A mejidie equaled 20 piastres (grush pronounced khurush) nominally, but the actual number varied according to locality. It was roughly about the size of an old-fashioned American silver dollar. Happily, we made a DVD of some of our more recent visits with Gunkamayr [Godmother] Oghda and integrated them into a broader picture for ‘family only’ private archives and viewing. It will perhaps not be very evident from the photograph that we used on the DVD cover but some scars where tattoos inflicted on her by her Turk ‘guardians’ were removed from her chin and corners of her mouth by an Armenian physician in Adana, named Krikorian (no relative), may be discerned on close examination. She was a lovely lady, and the youngest of the survivors of Korpeh. The background photos show what she looked like on her passport photo. She was about 12. Oghda immigrated into America with the Simonians of Korpeh under the pretense that she was Yeghazar Simonian’s daughter, a child from his first marriage, from which he became a widower. The Simonians are pictured on the Front cover of The Armenians of Worcester by Simonian granddaughter Pamela E. Apkarian-Russell (Arcadia Publishing, Charleston, S.C., 2000). The photograph derives from a so-called yard long photograph by Worcester photographer K.S. Melikian, a native of Yegheki village, on the Kharpert Plain very near to the twin cities. The photo was taken on 16 August 1931 at a gathering of Korpetsis and friends who were recovering after the Genocide, building families, trying to regain some status in the New World etc. 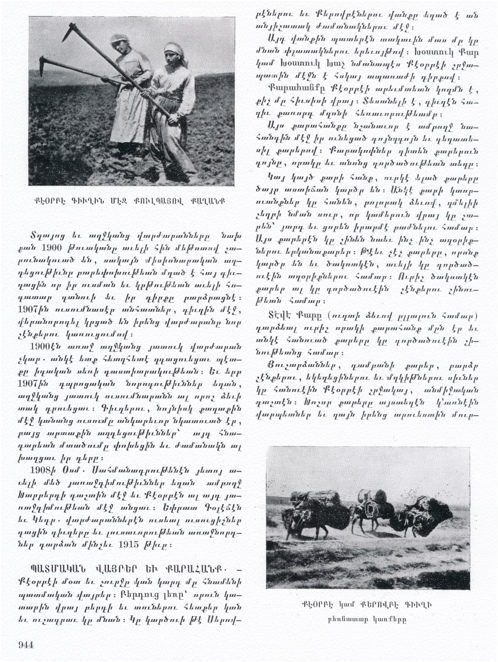 On the back cover there is a partial view of Altoon Mechigian DerKrikorian and three of her four children. The identification of the individuals in the yard-long photo has also been one of our projects. Numbers in red were put on individuals for identification, spread sheets circulated and as complete as possible identities, names in Armenian and nicknames and relationships achieved or at least attempted. All in all, the Korpehtsis have fared perhaps better at a personal identity level in terms of preserving their Old Armenia heritage than the people from many other villages. We have played a role in that and this makes us feel better. We know our roots.